Our schools show that children of different ages help one another. There are many things which no teacher can convey to a child of three, but a child of five can do it with ease. 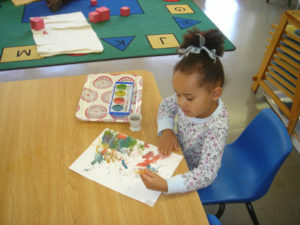 The Children’s House is the heart of the Montessori program. It provides preparation for grade school at both the preschool and kindergarten levels. The program is designed for children aged 3 to 5 years and meets 5 days a week. The Children’s House classroom environment allows for the balance of structure and flexibility that allows for the natural development of each child’s physical, emotional, and cognitive skills. The day is designed to allow children the freedom to explore the prepared classroom environment and complete work in each of the main areas of learning: Mathematics, Practical Life, Language Arts, Sensorial, and Culture. Concepts are introduced by the teacher in individual, small group, and whole group lessons. Children are allowed uninterrupted blocks of time to explore new concepts through the hands on use of self correcting materials which promote independence. Teachers are always observing to see when children are ready for new concepts and the curriculum is designed for each individual child. In this multi-age setting, children are encouraged to work as a team to enhance their individual learning. Younger children have the opportunity to see what the future holds for them by watching the older children. Older children have the opportunity to confirm what they have learned by sharing knowledge with younger children. The child to staff ratio is 8 to 1. There is a maximum of 21 children in each class. Half Day and Full Day options available. Must be at least 3 years old by December 1st. Children are expected to be toilet trained.